The models are a rose called "Smooth Buttercup" and Tilly-Trump, our smallest Jack Russell. She looks very delicate, but is in fact a feisty little thing. I love the Dog Rose. That looks like a variety, breed, my friend Amy Shojai would like. She raises fantastic roses in Texas and wrote the Purina Encyclopedia of Dogs and Cats as well as Pettiquette(Think I just messed of the spelling of her book. Have a wonderful Christmas. Hi Sally, thanks for the holiday wishes. 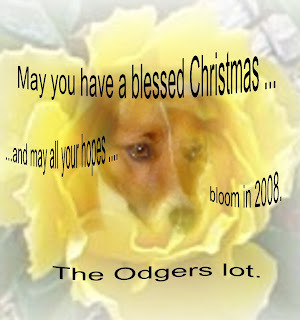 Hope the Odgers Lot have a wonderful Christmas.